Diana was the Writer in Residence for Commonwealth Writers during March and April 2014. Her posts are available online. Diana was a columnist for The Gleaner from 1994- 2001 and a collection of her columns was published under the title Writing Jamaica: People, Places, Struggles. Writing Jamaica: People, Places, Struggles,delivers a fascinating look at Jamaica, far beyond the island’s image as a tourist paradise. From the white sand beaches of Jamaica’s north coast – Negril, Montego Bay, Oracabessa, Portland – to the sprawling capital city of Kingston, Diana fearlessly tackles politics, the environment, relationships between Caribbean men and women and the complicated struggles of a developing country and its irrepressible people. 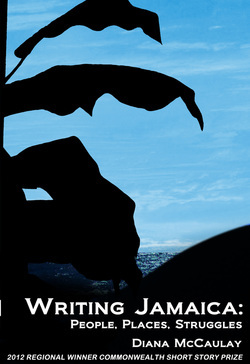 Writing Jamaica is a selection of Diana's most insightful, funny and captivating columns written over an eight year period. Always deeply grounded in the physical place, Diana’s articles describe her environmental journey as founder and CEO of the Jamaica Environment Trust – her efforts to organize annual beach clean ups, to bring environmental education to young Jamaicans, and to take a stand against the destruction of the island’s world famous beauty. Writing Jamaica will make you think, go "ahah! ", laugh out loud, and recognize yourself in universal human themes of life and love in this account of a person grappling with what life throws her way. When Diana left Jamaica to go to the University of Washington in Seattle, she continued to submit her columns, revealing the often hilarious impressions of a newcomer to the United States. The timeless themes of this sharply observed collection resonate with people anywhere. Writing Jamaica: People, Places, Struggles is available for Amazon Kindle, the Apple iBookstore, Barnes & Noble Nook and Kobo. "I enjoy your witty and perceptive articles in The Gleaner and share your passion for environmental conservation and protection"
"Congratulations on your articles, always stimulating"
"Diana McCaulay writes with appeal to a great many people"
"We salute your incisive analyses of Jamaican language and culture"